The Primary ( ) and Final ( ) FRCA examinations require an extensive knowledge of equipment and procedures. We have therefore written a new educational resource section on these subjects. The tutorials have been tailored to the FRCA syllabus and we have also added some past questions relevant to these topics. Read other sections by using the navigation bar on the right side of every page. Describe the anatomy of the larynx. What is the nerve supply? Candidates must be able to demonstrate their knowledge of practical invasive procedures, with an understanding of the principles and hazards involved. 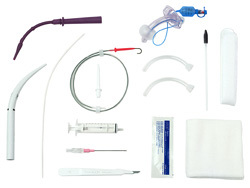 Describe the technique of percutaneous tracheostomy, including all the relevant anatomy. What are the complications? 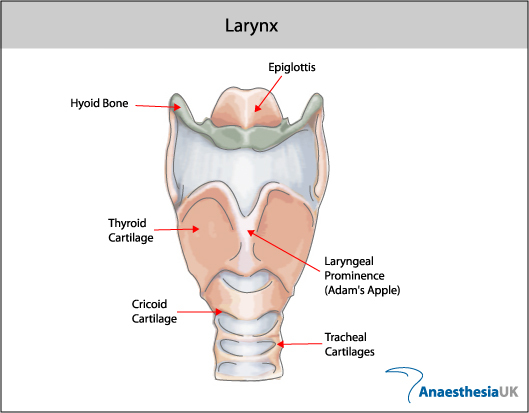 The larynx is a valve separating the trachea from the upper aerodigestive tract. It is primarily thought of as an organ of communication but it is also an important regulator of respiration, and is necessary for an effective cough or valsalva manoeuvre, and prevents aspiration during swallowing. Hyoid bone - attachment to epiglottis and strap muscles. 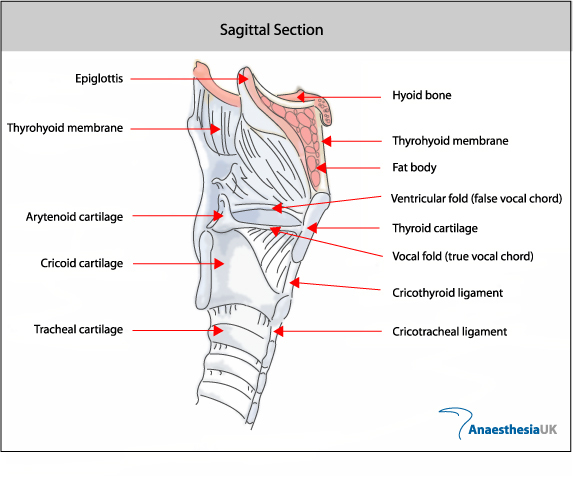 Thyroid cartilage - anterior attachment of vocal folds. Posterior articulation with cricoid cartilage. Cricoid cartilage - complete ring. Articulates with thyroid and arytenoid cartilages. Arytenoids - two cartilages which glide along the posterior cricoid and attach to posterior ends of vocal folds. Supraglottis - usually covered with respiratory epithelium containing mucous glands. Epiglottis - leaf-shaped mucosal-covered cartilage, which projects over larynx. Aryepiglottic folds - extend from the lateral epiglottis to the arytenoids. False vocal cords - mucosal folds superior to the true glottis. Separated from true vocal folds by the ventricle. Ventricle - mucosal-lined sac, variable in size, which separates the supraglottis from the glottis. 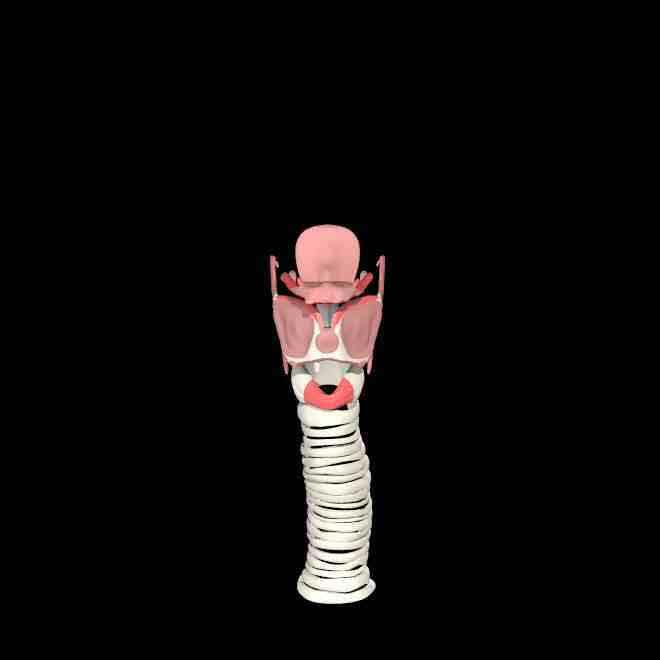 Glottis - the true vocal folds attach to the thyroid cartilage at the anterior commissure. The posterior commissure is mobile, as the vocal folds attach to the arytenoids. Motion of the arytenoids affects abduction or adduction of the larynx. The bulk of the vocal fold is made up of muscle covered by mucosa. The free edge is characterised by stratified squamous epithelium. The vocal folds abduct for inspiration and adduct for phonation, cough and valsalva. Subglottis - below the vocal folds, extending to the inferior border of the cricoid cartilage. Branches of the vagus nerve. Superior laryngeal nerve - sensation of the glottis and supraglottis. Motor fibres to the cricothyroid muscle, which tenses the vocal folds. This nerve leaves the vagus high in the neck. Recurrent laryngeal nerve - sensation of the subglottis, and motor fibres to intrinsic muscles of the larynx. This nerve branches from the vagus in the mediastinum, then turns back up into the neck. On the right, it travels inferior to the subclavian artery, and on the left, the aorta. Although inhalation anaesthesia is possible, a total intravenous technique provides much smoother anaesthesia and better conditions for performing the bronchoscopy and tracheostomy. A combined propofol and opioid technique is a favoured option. Full monitoring is instituted, and ventilatory parameters altered during the bronchoscopy to maintain adequate oxygenation and end-tidal CO2 levels. Following induction of anaesthesia, the patient is prepped and draped. The bronchoscope is passed through a tracheal tube and the anatomy of the airway visualised. The aim of the fibreoptic scope is to ensure correct initial placement of the introducer needle, in the midline and through the second or third tracheal rings. Subsequent to this, it will monitor dilation of the trachea, and ensure that the introducer does not remain in the trachea. Although not necessary for the procedure, information from bronchoscopy is very useful and it should always be used when learning the technique. The patient is positioned with the neck extended, with an intravenous fluid bag between the shoulder blades and the head in a head ring. This brings as much of the trachea as possible into the neck. The larynx and cricoid cartilage with the intervening cricothyroid membrane are identified. From the cricoid, moving caudally, the tracheal rings are identified. The tracheostomy should ideally pass between the second and third tracheal rings, although a space one higher or lower may be employed. Placing the airway higher, next to the cricoid, can cause tracheal erosion and long-term problems. Local anaesthetic with adrenaline is infiltrated subcutaneously, and a 1 cm incision made horizontally with a scalpel. Keeping in the midline at all times, the introducer needle and syringe are advanced, at 45 degrees to the skin, until air is aspirated from the trachea. The guidewire is passed through the needle, then the small dilator (green) is passed. This is then removed and the white introducer passed into the trachea. The guidewire is removed. Now only the white introducer is left in the trachea. Over this the tracheal dilator(s) (blue) are passed in order, gradually dilating the incision to accommodate the appropriately sized tracheostomy tube. Plenty of lubricating jelly is applied to each dilator, and they are passed down the tract with a twisting motion. Only moderate downward force is applied. If the dilator does not pass easily, return to the previous smaller dilator and ensure that it passes freely and easily. Often, it is the skin that impedes progress, and the incision has to be slightly widened with the scalpel. The portex kit consists of a one-step dilatation. Each size of tracheostomy tube has a corresponding dilator size (see the manufacturers' instructions), and this should pass freely and easily into the trachea before attempting to insert the tracheostomy tube. Once the tracheostomy will easily accept the final dilator, the tracheostomy tube (cuff already checked) is loaded onto the dilator one size lower. The tracheal tube is wathdrawn, under direct vision, into the larynx, and the tracheostomy tube is passed over the introducer into the trachea. Once again, undue force should not be necessary. Use plenty of jelly and, if required, return to the previous dilator. The use of the tracheal dilator instruments is rarely necessary, and may be hazardous. However, if the introducer is inadvertently pulled out of the trachea, or some other mishap occurs, they may be useful in relocating the tract for replacement. With the tracheostomy tube in place, the tracheal tube is removed and the ventilator is connected to the tracheostomy. The chest is auscultated for adequate ventilation and the ventilator checked for appropriate tidal volumes and airway pressures. The tube is secured with tapes or ties. Elective percutaneous dilatational tracheostomy. A new simple bedside procedure; preliminary report. Ciaglia P, Firsching R, Syniec C. Chest 1985; 87: 715-19. Percutaneous endoscopic tracheostomy. Paul A et al. Ann Thorac Surg 1989; 47: 314-15. Percutaneous dilatational tracheostomy. Results and long-term follow-up [see comments]. Ciaglia P, Graniero KD.